Morning entrance: 8.30 to 11.30. Afternoon entrance: 12.30 (November to March) or 14.30 (April to October) till closing time. Colosseum closing time varies depending on the season; approximately 4.30-5.30 pm from November to March and 6.30-7.15 pm from April to October. Late afternoon or early morning. 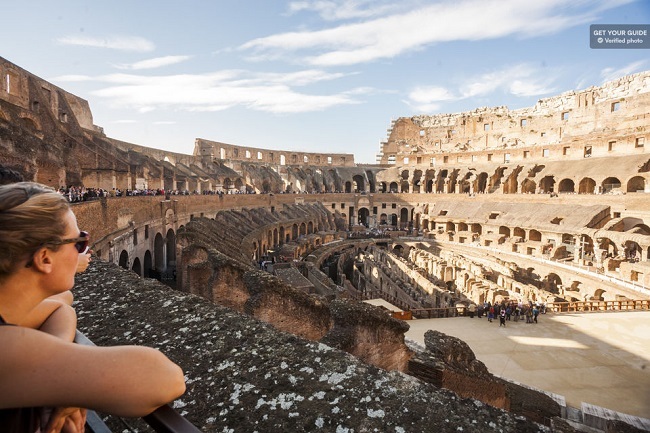 We are comparing Colosseum, Roman Forum and Palatine Hill with Audioguide Prices from leading ticket suppliers and Try to find you Cheap tickets prices on the market. The ancient Colosseum is one of the top attraction in Rome and entrance queues can be painfully long. Save yourself some time with a Combo Skip the Line ticket to the Colosseum and entrance to the Roman Forum and Palatine Hill. Both practical and reasonably priced this ticket includes a multilingual audio guide so you can learn the facts and fiction behind the Roman Empires largest building. The Colosseum entrance ticket also grants you access to the ancient political centre, known as the Roman Forum. Chose to visit all attractions on the same day, or take your time at the Colosseum and climb Palatine Hill to the Roman Forum the following day. This ticket gives you some flexibility to explore at your own speed. This fast track ticket is perfect for people who are interested in history and Roman architecture. The fast track ticket is a good option for budget travellers or people on a short city break. Suitable for all ages but the site will be challenging for anyone with walking difficulties. Your Experience With Colosseum, Roman Forum and Palatine Hill with Audioguide? Explore Rome's top 2 archaeological sites, the Colosseum and the Roman Forum and enjoy views of both sites from Palatine Hill. Learn about the wild animals and Gladiators battled in the Arena over 2,000 years ago and hear the facts and stories of the Roman Empire with a free audio guide. Save time and skip the line at the Colosseum. What Colosseum, Roman Forum and Palatine Hill with Audioguide Includes? Entrance to the Colosseum, Palatine Hill and the Roman Forum. Fast track entrance to the Colosseum and audio guide in English, Italian, Spanish, French, Portuguese, German, Russian, Arabic, Chinese or Japanese. Free downloadable map of Colosseum. During the peak season and holidays you should book the earliest time slot available in order to have time to enjoy the site before it becomes crowded. Travelers Reviews about Colosseum, Roman Forum and Palatine Hill with Audioguide? This tour has an average 4.4-star rating on Get Your guide and an average 4.5-star rating on TripAdvisor. Comments generally agree that this fast-track ticket is excellent value and very convenient to use. Some travellers point out that is you want to see all the attraction in one day then you will need to book your entrance for the morning so that there is enough time before attractions close. Vouchers in electronic or printed for can be exchanged at the ticket office. Tickets can be cancelled and fully refunded up to 24 hours before scheduled day. Ticket is valid for 2 days and includes one entrance to Rome Colosseum and one entrance to the Roman Forum and Palatine Hill. Colosseum entrance time can be booked at the ticket office and Colosseum audio guide can be collected up to 2 hours before ticket office closes. Discounts apply for EU citizens aged 18 – 25 with a valid ID. Collection Point: Ticket desk on Colosseum Square.